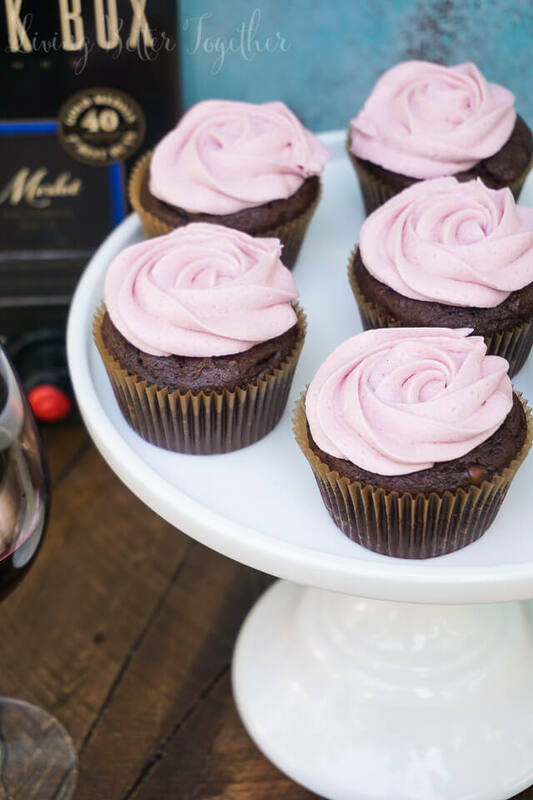 These Chocolate & Merlot Cupcakes are perfect for entertaining summer guests! 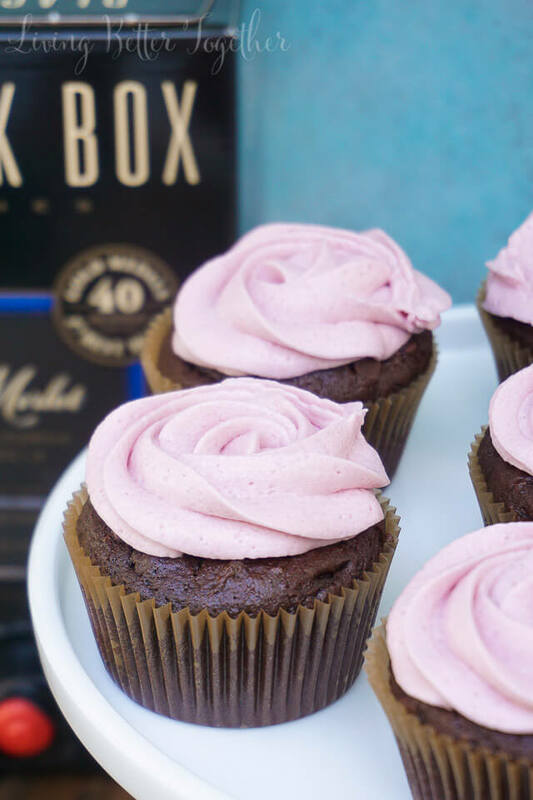 Rich chocolate fudge cupcakes meets a fine Merlot buttercream for a decadent dessert. Summer has finally arrived, or so says the 90 degree weather we’ve had for the last week here in Maine. I know to some of you that isn’t “hot”, but for me it’s way too hot if I’m not on a beach somewhere. Luckily, I was able to bake these cupcakes for the 4th, before the heat set in (hence the sweater). As we made plans for the holiday and got family together, I wanted to make a dessert that was great for summer parties. 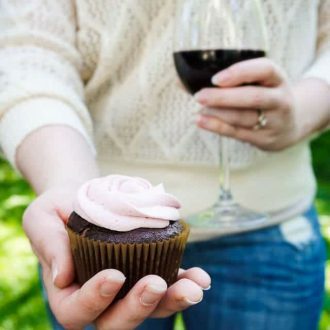 I didn’t want anyone to have to deal with the hassle of a plate and fork, I simply wanted everyone to be able to grab a cupcake and stand on the back deck or out by the lawn games. Cupcakes are such a great and no fuss on the go treat. And you can’t have a cupcake unless you’ve got something to wash it down with. 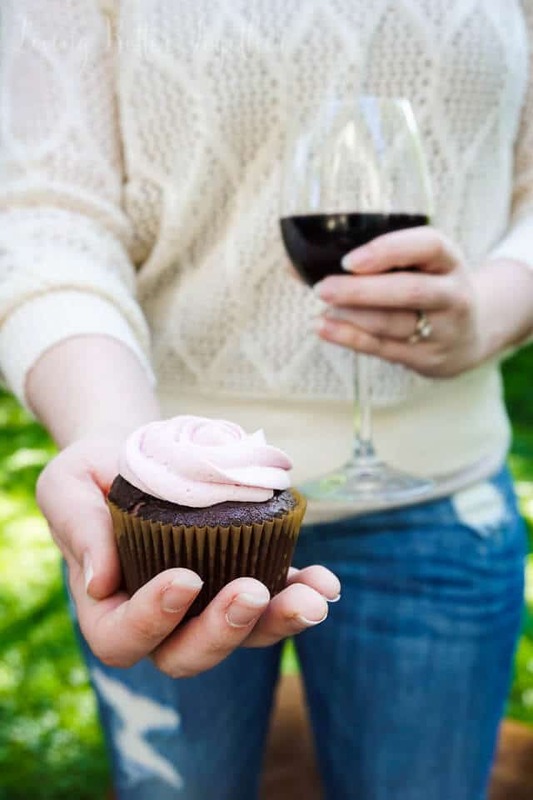 In this case, Black Box Merlot Wine was just the pairing, especially since the frosting in these yummy cupcakes is laced with it. Can you say “YUM”! 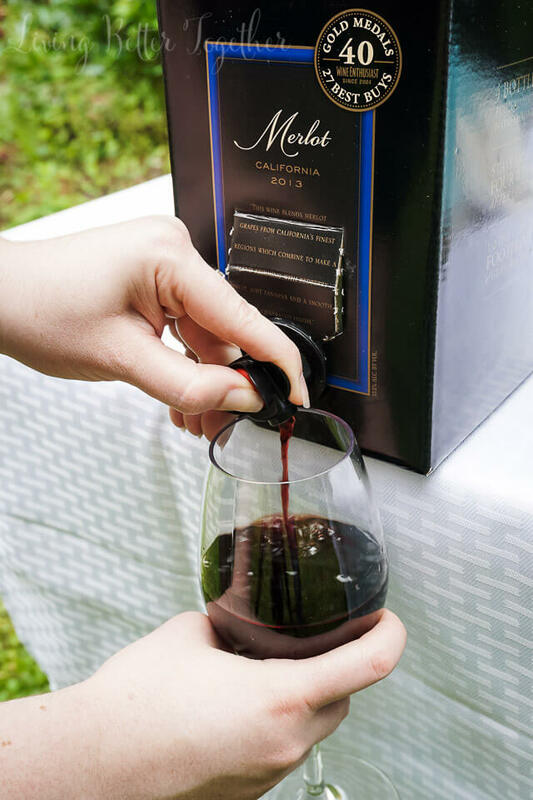 Black Box Wine has won over 50 gold medals for its quality and it’s 40% cheaper than most wines, leaving more spending cash for summer activities. Since Black Box Wines are so portable, they can enjoy your day at the beach or your back yard bash with you! 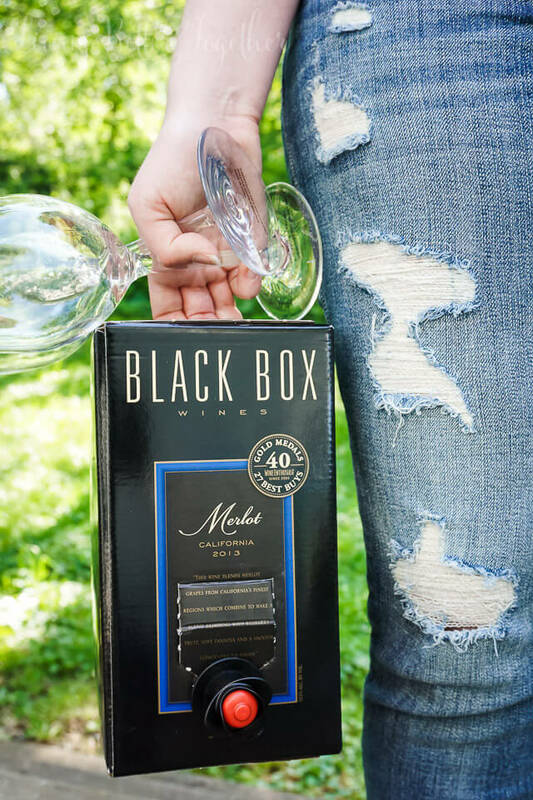 Black Box Wine stays fresh up to 6 weeks after opening making it perfect for both large gatherings or multiple small get togethers. Oh right, and we really need to talk about these cupcakes! They’re made with my chocolate fudge cupcake base that you’ve seen here, here, and here. I finished them off with a silky smooth and flavorful Merlot buttercream made with the Black Box Wine. 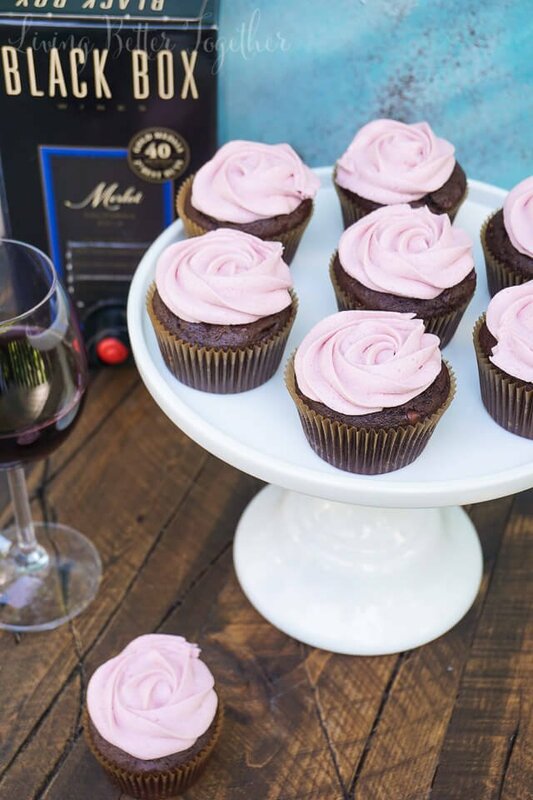 The frosting takes a little extra attention in order to reduce the wine for a beautiful full-bodied syrup, but the results are so worth it! Visit the Simple Entertaining Social Hub for more recipe and summer entertaining ideas. Don’t forget to enter the sweepstakes while you’re there! What’s your favorite way to enjoy a glass of wine in the summer? Bake for 18-22 minutes until toothpick comes clean. Start on frosting instructions below. Meanwhile, add 1 cup of the Merlot and the granulated sugar to a small saucepan over medium-high heat and stir until the sugar dissolves. Bring to a boil, then reduce heat to a simmer until the mixture has reduced to a about 1/3 cup, about 25 minutes. Allow the red wine reduction to completely cool in the fridge. In an electric stand mixer fitted with a paddle attachment, cream butter until fluffy. Gradually add confectioner's sugar a half cup at a time, beating until combined. Add heavy cream and beat until light and fluffy for about 1-2 minutes. Slowly add the cooled Merlot reduction and continue to beat the frosting until smooth. Add the last 2 tablespoons of red wine one at a time and beat until smooth. Add additional confectioner's sugar a 1/4 cup at a time if needed to reach desired frosting consistency.